Is SU QLD government funded? What is SU QLD and what do you do? Scripture Union Queensland (SU QLD) is a Christian not-for-profit organisation dedicated to seeing each child and young person connected and supported in community, serving others, and experiencing fullness of life. The organisation runs programs that positively support young people through school chaplaincy, camping, at-risk programs, and Bible-reading resources. SU QLD is also an accredited training facility (RTO 30548) offering courses in Youth Work. Scripture Union Queensland is a member of Scripture Union Australia and the worldwide Scripture Union International community. For more information, visit suqld.org.au or phone (07) 3112 6400. Stewardship is one of our core values. As stewards of opportunities and resources, we aim to be creative, innovative, sustainable, responsible, and effective. For this reason, we believe it is our responsibility to make every dollar count. For every $1 donated to SU QLD, 84 cents goes directly to running programs, 11 cents to delivery and support, and 5 cents goes towards multiplying your gift through fundraising and engagement activities. You can read all about the ways your faithful giving is making a difference in our latest Annual Report. Are all donations to SU QLD tax deductible? Not all donations to SU QLD are tax-deductible. However, all gifts over $2 donated to school chaplaincy are tax deductible, unless otherwise specified. Is SU QLD affiliated with any church or denomination? SU QLD is a non-denominational Christian organisation dedicated to seeing each child and young person connected and supported in community, serving others, and experiencing fullness of life. In working towards this vision, SU QLD has, since its inception, worked closely with local Christian churches of all denominations across Queensland to bring God’s love, hope, and good news to children, young people and their families. The work of SU QLD is made possible, in part, through funding from the Australian Federal and State governments. This funding only covers the work of school chaplaincy. Currently, the funding employs a school chaplain for less than two days a week, which is not enough to meet demand for most school communities. This is where your support comes in. 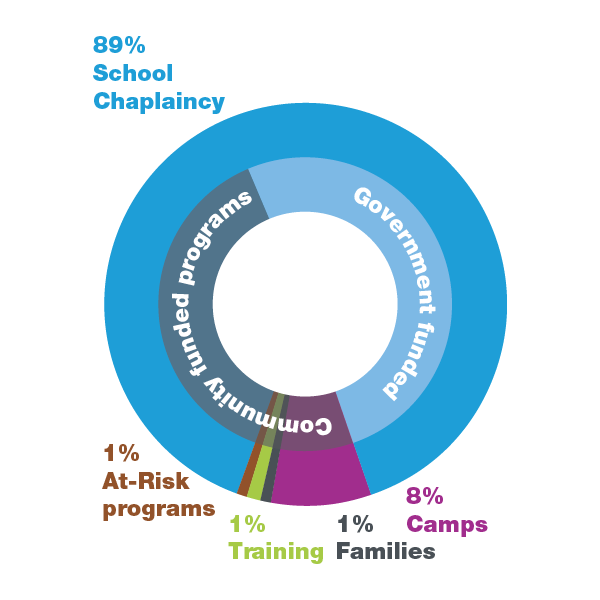 Thanks to generous friends like you, almost half of the time chaplains are in schools is a direct result of your faithful support. What qualifications do chaplains have? All SU QLD chaplains hold a minimum Certificate IV in Youth Work and also hold, or are working towards, a Diploma of Youth Work, or hold a higher qualification in a relevant field (e.g. Education, Social Work, Counselling, Psychology). SU QLD chaplains must also hold units in ‘appropriate referral’ and ‘mental health’. How can I become an SU QLD chaplain? It’s easy to start the ball rolling! Got to apply.chappy.org.au and start an application. You will need to upload a current Blue Card, and copies of qualifications and related transcripts. What is a pastoral conversation? The one-on-one interactions school chaplains have with students are best characterised as role modelling, mentoring, and pastoral care. School chaplains do not provide counselling or case management services to students. Students talk to school chaplains about peer issues, bullying, school behaviour, family issues, and wellbeing concerns. Issues that are more complex and serious are referred on to other professionals and specialists. No. Chaplains are inspired by their Christian faith to serve those in need. They aim to model the love and compassion of Jesus Christ as they serve in schools. Their role requires them to be non-judgmental and non-coercive in their support of all students, regardless of the student’s issues or worldview. Every school chaplain is bound by State Government policies and procedures about their conduct in schools. How do you help ‘at-risk’ youth? While school chaplains are available to everyone, they are particularly interested in supporting individuals and groups who might be considered ‘at-risk’. Many children and young people face difficulties, including family breakdown, bullying and self-esteem issues. Through early intervention activities, school chaplains support at-risk students, increasing their chances of experiencing better life outcomes. How can I become an SU QLD Camp leader? If you’re a Christian, over 18 years of age and love surfing, sport, honing your digital skills, or creatively expressing yourself through dance and art while having fun and serving others, volunteering as an SU QLD camp leader is just for you! Use your talents and passions in life to make a real difference in the lives of our next generation. Simply fill in your details and take your first step towards leading a group of waiting campers on the time of their life! Are there other ways to support the work of SU QLD other than donating money? SU QLD has more than 4000 volunteers working in ministry every year. Some people help run our camping programs in their local area, others help their local chappy make breakfast for students, and some call our donors to pray for them. Whatever their gifting, volunteers are a crucial part of SU QLD’s mission! Call us today on 3112 6400. The work of SU QLD is continued through the generous giving of finances and time from our supporters and volunteers, but without the prayers of everyday Australians with a heart for children and young people like you, we could not continue this vital work. Please consider praying for your local school (teachers, students and chappies), SU QLD Camps, at-risk youth programs, and our trainers and students studying to become youth workers. We have hundreds of people around the state who pray regularly for our ministries. We send prayer notes to these faithful friends every week with particular points that need attention. To become a Prayer Partner, email prayer@suqld.org.au, or call 1300 478 753. A bequest to SU QLD is an investment in the ongoing ministry to children and young people. It is a living legacy that enables you, in partnership with SU QLD, the local church, and local communities, to do more — so much more. If you would like more information about bequests, please contact our team on 3112 6402. All conversations will be kept in confidence. A special way to honour the memory of your loved one is to encourage those touched by their passing to make a gift towards the vital work of SU QLD in lieu of giving flowers. Approximately 3-4 weeks after the first donation is received, SU QLD will write to the next-of-kin informing them of all donations made in memory of their loved one. For more information, please call Yvette on 3112 6402 or 0427 006 390. How can I support my school/my child’s chaplain? The cost of employing a chappy one day per week in a school is about $10,000 per annum (including on-costs), and five days costs approximately $50,000 per annum. 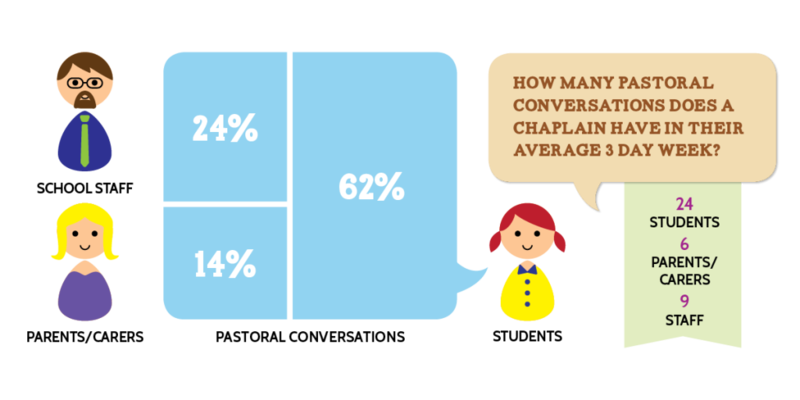 Consequently the number of days a chaplain is available in a school is determined not so much by need (which is huge), but by how much money can be raised to support them in that school. Apart from government funding, the funds to employ SU QLD chaplains are generated in local communities via donations and fundraising ventures. Talk to your school’s Local Chaplaincy Committee (LCC) to see what chappy-specific fundraising events are planned for the year and volunteer to help if you can. If none are planned, talk to your chappy about organising a fundraiser. If you’re not sure who your school’s LCC is, get in touch with the Parents and Friends Committee. We also have a number of annual fundraising events you might like to consider, including our Frontline Appeal dinner, Golf Day, Bridge to Brisbane team, and Chappy Week. Does every school have a chaplain? No. While more than 67% of Queensland state schools have a chappy (63% in primary and 88% in high schools) serving more than 400,000 children and young people, there are around 400 state schools without. Are chaplains bound by a confidentiality agreement in their work with students? Section 426 of the Department of Education’s EGPA (‘the confidentiality provision’) requires that employees of state schools must not record[j1] , use or disclose a student’s personal information unless one of the exemptions in the section applies. While chaplains are employed by SU QLD, they are contracted to their respective school and are, therefore, required under the Deed of Agreement to sign a Deed of Confidentiality, Privacy and Conflicts of Interest and to provide this to the principal prior to commencing service in a school. The reason a student seeks access to, and the outcome of any consultation with, a chaplain will not be disclosed by the worker without the parent’s consent, student’s informed consent, or unless required by law. SU QLD is committed to the safety and holistic wellbeing of all children and young people. To ensure that children and young people are kept safe from harm, our staff and volunteers are required to possess a current blue card; agree to adhere to a code of conduct when working with children; and undergo training in child safety. SU QLD takes child protection and safety very seriously. Consequently, we have policies and procedures in place to ensure your child has the best possible experience with us. “All children deserve a safe and happy childhood“. Those important words begin the document establishing the Royal Commission into Institutional Responses to Child Sexual Abuse in Australia. Over the next three years, as the Royal Commission does its work, the Australian community is likely to hear many tragic stories about the innocence and trust of children being betrayed, and of instances where institutions have failed to support the child. Abuse is sickening, and it is an important part of the life-long healing process that victims have an opportunity to be heard and supported on that journey. 2013 promises to be a year of great opportunity for us as we continue to bring hope to a young generation. As always, I’m deeply grateful for your prayers, gifts and other sacrifices. This work is only possible because of faithful friends like you. 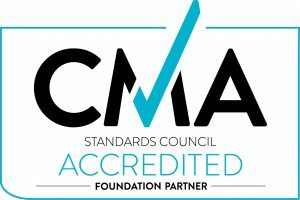 What is SU QLD's connection with the National School Chaplaincy Association? The National School Chaplaincy Association (NSCA) is a network of Christian chaplaincy organisations in Australia. It is represented by ACCESS Ministries (VIC), Schools Ministry Group (SA), Generate Ministries in NSW, School Chaplaincy ACT and Scripture Union (Queensland & Tasmania). For more information, go to www.schoolchaplaincy.org.au. Can I use SU QLD's logo? We have provided a logo kit to download that includes our corporate logos, visual elements, and our official style guide. Please read the SU QLD logo guidelines carefully before using our logo. Download the SU QLD logo and elements in various colours and formats. What is SU QLD's role in inclusivity and gender diversity? Queensland’s Department of Education and Training has a policy of inclusivity that seeks to ensure “that schools are supportive and engaging places for all school community members”, including in supporting the wellbeing of students dealing with sexuality and gender identity issues. We promote a supportive environment in schools through our school chaplaincy services. Our work is pastoral: We provide a safe environment in which children and young people can work through any issues or concerns they may have. Our role is to support, not to judge. Our work is holistic: We support all young people, in all their dimensions – personal, relational, local community, and societal. Our work is compassionate: We have a particular interest in helping all young people at risk, and all that entails, achieve positive life outcomes. Our work is spiritual: We do not seek to impose a particular theological view on young people. We think all young people should have opportunities, without coercion or manipulation, to explore and form views on spirituality: their relationships with God, others, and the world around them. Our work is collaborative: We work with others for positive life outcomes for young people. What is the importance of spiritual wellbeing in education? Spirituality can be understood as a connection between people and the divine, other people, and the world around them. For decades, the youth work field and other human services fields have not been sure of what to do with spirituality. As a result, they have largely carved it out of their models used to engage with young people and their wellbeing. But there is a growing realisation of how important spirituality is to overall mental health and wellbeing. You can read more in our School Chaplaincy and the Wellbeing of Young People white paper. I have a complaint or other feedback. Who can I talk to? We encourage any individual who may have a complaint or wishes to appeal a decision to contact SU QLD. If you already know an SU QLD staff member, we suggest you contact them first regarding your complaint. If you have hesitations about discussing your concerns with that person, or you are dissatisfied with their response, please contact our Support Team on 07 3112 6470 or support@suqld.org.au, who will seek to resolve the matter or refer you to the appropriate person or team to seek a resolution.